I love The Brownstone Restaurant. It’s one of my favorite local places to eat so I was thrilled when owners Dale & Connie Decaire wanted to be part of our guest chef series. I’ve had their gnocchi so I can attest to the fact that it’s fan-freaking-tastic! 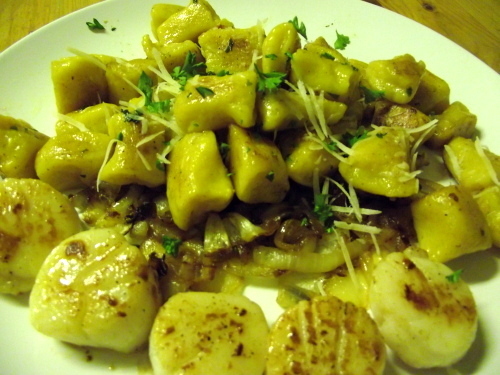 It’s also a great platform for additional flavors- in this case, I’ve served the gnocchi with caramelized onions & seared scallops. Cut the squash in half, remove seeds & core and roast cut side down on parchment lined baking sheet tightly wrapped in foil at 325 for about 40 minutes or until tender. When dough starts to come together work quickly with hands for about 2 minutes- do not over work. Separate dough into two balls, cover in plastic wrap and allow to rest in fridge for 30 minutes. Cut each ball in half on a well floured surface. Roll each ball into an 8 to 10 inch long rope and then cut rope into 3/4 inch pieces. Place gnocchi in small batches into gently simmering water. When they float to surface, remove with a slotted spoon and place on a lightly oiled tray to cool. When you’re ready to serve quickly brown in a pan with foaming butter for no more than one minute- serve immediately.